Earlier this week, I reviewed Highbrow, a handy utility that lets you quickly change your default browser and, even better, choose a different browser on the fly to open a particular URL. Such functionality can be quite useful if you develop Web sites and need to test your work in different browsers; if you’re opening a site that you know works better in a browser other than your preferred one; or if you’re just testing several browsers to determine which to use full-time. 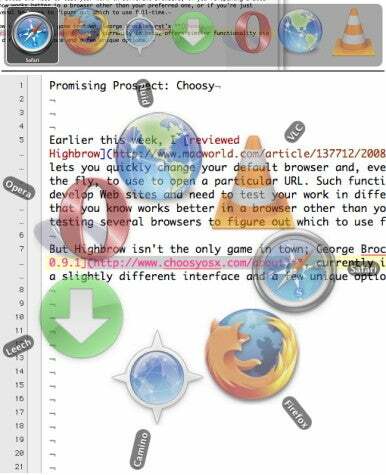 But Highbrow isn’t the only game in town; George Brocklehurst’s Choosy 0.9.1, a System Preferences pane currently in beta, offers similar functionality via a slightly different interface and with a few unique options. As with Highbrow, whenever you click on a Web link outside of a Web browser, Choosy lets you choose the browser used to open that link. Specifically, Choosy’s browser picker pops up, displaying all the programs that you might use to open the link; you use your mouse cursor or the arrow keys to pick the desired program. But that’s where the similarities between Highbrow and Choosy end. On the one hand, Choosy is missing Highbrow’s options to automatically pick the most-recently-used browser or to simply use your preferred browser. 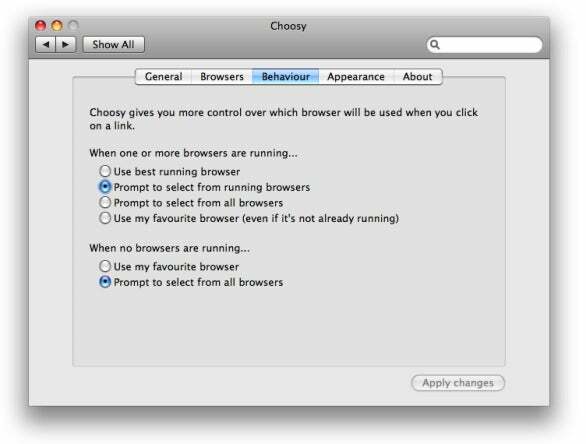 On the other hand, Choosy gives you several alternate behaviors of its own, and you can choose different options depending on whether any browsers are already running. For example, if no browsers are running when you click on a Web link, Choosy can either launch your favorite browser or ask you to choose a browser. If one or more Web browsers are already running, the options include using the “best” currently running browser; asking you to choose from among currently running browsers; launching your favorite browser; or asking you to choose from among all browsers. Although I miss Highbrow’s most-recently-used option, Choosy’s alternatives are varied and useful. You may be wondering what I meant by the “best” browser in the previous paragraph. Another feature unique to Choosy is the capability to rank your browsers. Choosy’s Browsers screen lists all programs that claim to handle Web URLs. By dragging individual programs up and down in the list, you rank those programs from most to least preferred; you can also force Choosy to ignore a program completely by unchecking the box next to the program’s name. Unfortunately, as with Highbrow, you can’t manually add programs to this list (although this feature is in the works). Unlike with Highbrow, you can’t quickly change Choosy's behavior; for example, I like that I can use Highbrow’s menu-bar menu to change its behavior back to “default browser” whenever I plan on using my default browser for a while. Which Choosy, I need to open System Preferences to make such a change, which is a hassle. I’d also like the capability to open a URL in my default browser—the OS X default, not the Choosy default—regardless of my current Choosy setting; for example, by clicking on a link while holding down a modifier key. But to be fair, Choosy is still a beta. It's got a few bugs; for example, I often found that even if I had one of the automatic options—to use the best browser or my favorite browser—selected, Choosy would still pop up the browser picker. In addition, the developer lists a number of upcoming features on the program’s Web site. I’m looking forward to the first official release.